What is Air China's baggage allowance? Find out here. To avoid Air China's high excess baggage fees and in order to transport more luggage than Air China permits, you can simply ship your luggage with Send My Bag. Discover how cost effective this is by getting your free quote. If you send your luggage to your destination, you will enjoy a much more relaxing journey without waiting around at check-in or at baggage carousels. Plus, you can just hop in a taxi to your hotel, where your luggage will be waiting for you. Economy may bring one item of hand luggage onto the plane with them. This item must weigh no more than 5 kg (11 lbs). First and Business Class passengers may bring two pieces of carry-on luggage, each weighing no more than 8 kg (17 lbs). Each piece of carry on must be no larger than 55 x 40 x 20 cm (21 x 15 x 7 in). If your bag exceeds Air China’s dimension or weight allowances, it must be checked into the hold. If your musical instrument fits within the carry-on baggage allowance, you can bring it on board as one item of carry-on luggage. If your instrument exceeds these dimensions, you can purchase a baggage seat ticket for your instrument, which is the same price as a passenger ticket. There is a free baggage allowance included in all Air China fares. Air China’s baggage allowance for Economy Class passengers is 20 kg (44 lbs) of luggage. Business Class passengers may check 30 kg (66 lbs), and First Class passengers may check 40 kg (88 lbs). Each item must not exceed 100 x 60 x 40 cm (39.4 x 23.6 x 15.7 in). Infants are given a 10 kg (22 lbs) allowance. Economy Class customers may check into the hold one piece of luggage weighing no more than 23 kg (50 lbs). First and Business Class passengers may check up to two pieces, each weighing no more than 32 kg (70 lbs). Items must not exceed 158 cm (62 in) in total dimensions. Economy passengers may check two items of hold luggage, each weighing no more than 23 kg (50 lbs). First and Business Class may check up to two pieces, each weighing no more than 32 kg (70 lbs). Passengers with infants are allowed to bring one extra 23 kg (50 lbs) piece of luggage, as well as a foldable bassinet or stroller. Should your baggage exceed weight or size restrictions, Air China will charge excess baggage fees. On domestic routes you will be charged per kilogram. The fee is 1.5% of the published one-way Economy adult fare for the route you are travelling on. 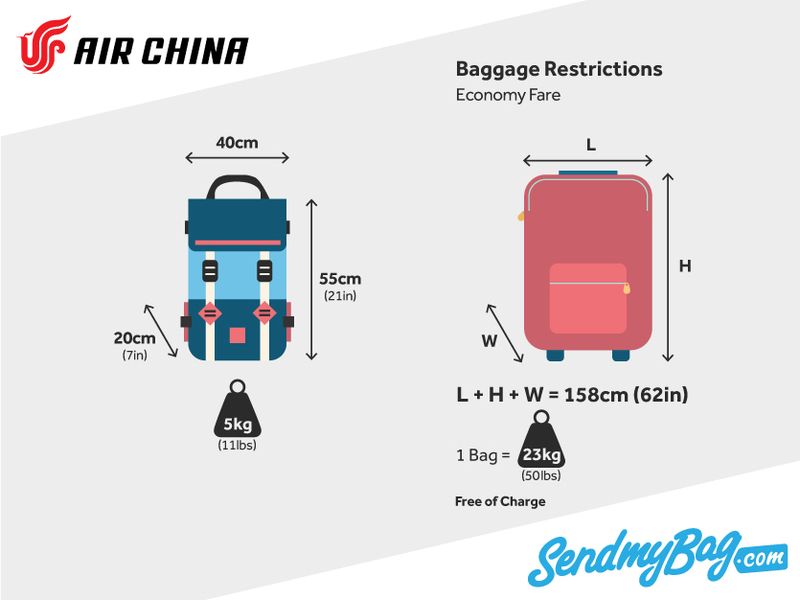 On international routes you will be charged for extra bags over Air China’s baggage allowance, for a bag that is too heavy, or for a bag that is too large in size. One extra piece of luggage would cost 700 RMB or 110 USD. A second extra piece of luggage would cost 1000 RMB or 155 USD. A bag that is too heavy OR too large would cost 490 RMB or 75 USD. On routes operating a weight-based system, the free baggage allowance for infants is 10 kgs, with the dimensions of each piece of baggage not exceeding 100 x 60 x 40 cm. On routes with a piece-based system, the free infant baggage allowance is 1 piece at max. 23 kg, with dimensions not exceeding 115 cm in total. You may also check a bassinet or stroller for free. Looking for Air China sized hand luggage?